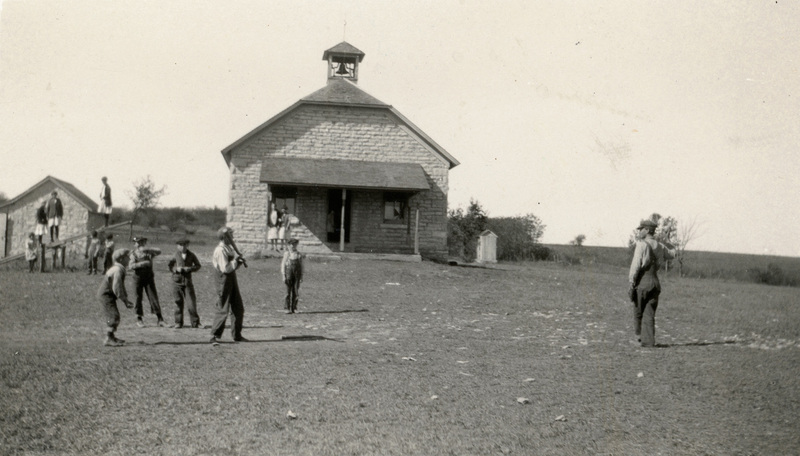 Wabaunsee County’s first school district was created at the town of Wabaunsee in 1859 and by the end of the 19th century there were 88 districts in the county. 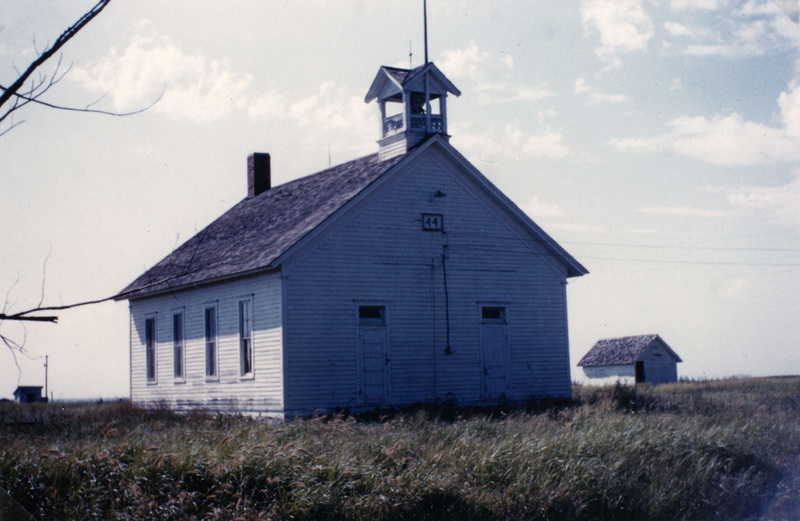 Except for the “city schools”, all of the rural districts operated only one building and the vast majority had only one teacher in their employ. The number of districts grew to 91 schools at their peak, but by the 1930s some rural districts were experiencing declining enrollment numbers. Statewide, there were almost 10,000 school districts, and the State of Kansas saw a need to implement statewide consolidation. 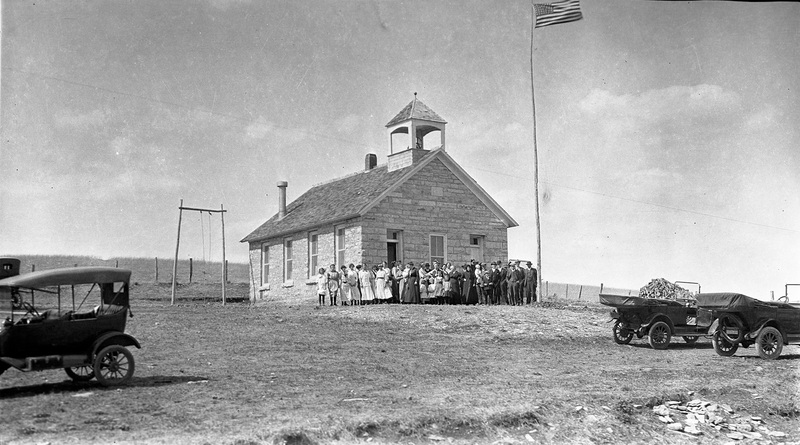 It became evident, shortly after World War II that the one-room schools in Kansas would soon be a thing of the past. District No. 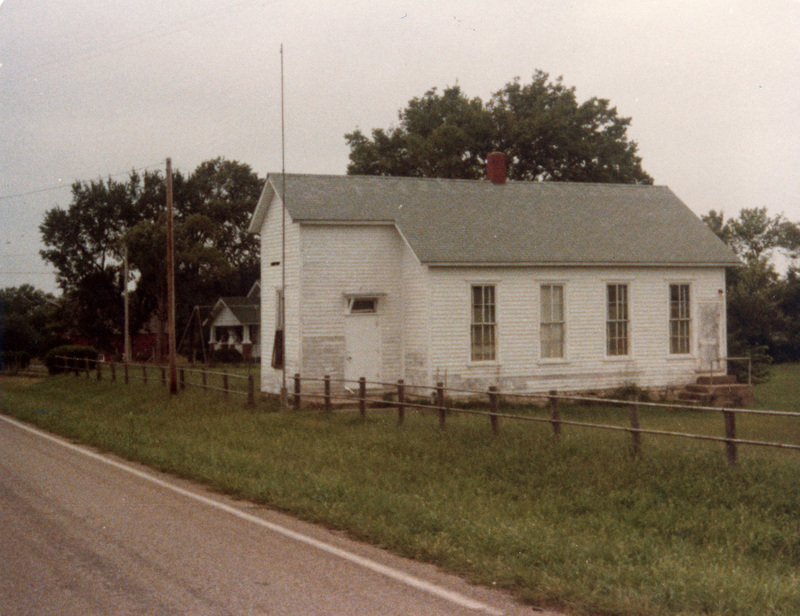 24, the Snokomo School is one of two school buildings in Wabaunsee County currently listed on the National Register of Historic Places. In this view, circa 1920, the Woodman Hall is visible in the background. 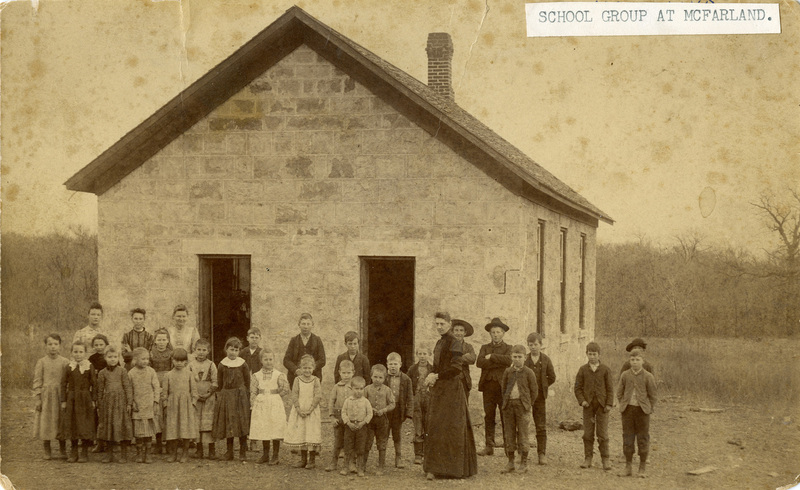 In 1901 the first consolidation legislation was passed in Kansas that empowered the County Superintendent of Schools to close and merge any rural districts that had fewer than five students in their school. 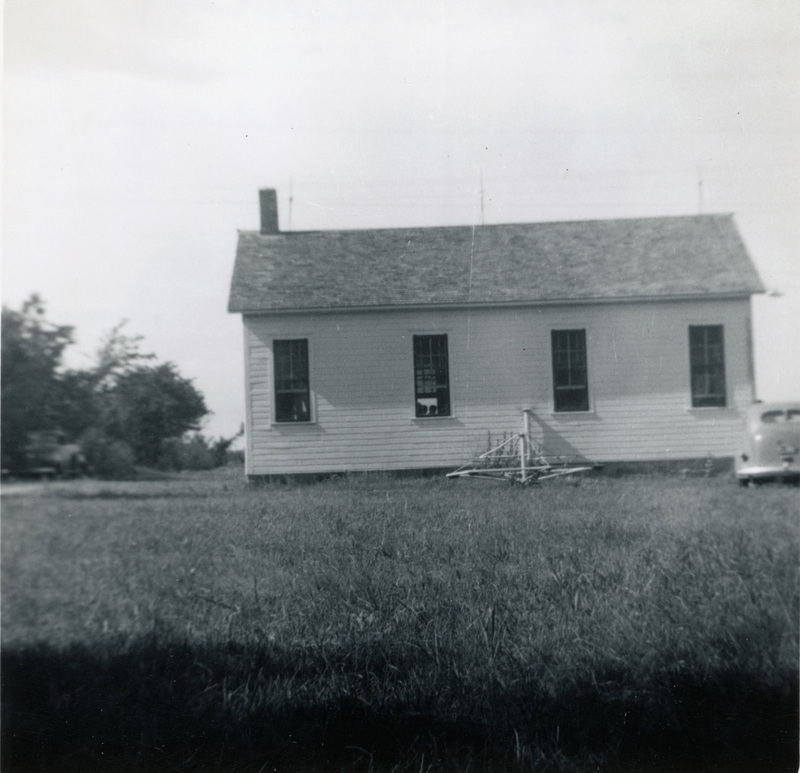 Many one room schools in Wabaunsee County began closing during the 1930s and the 1940s. 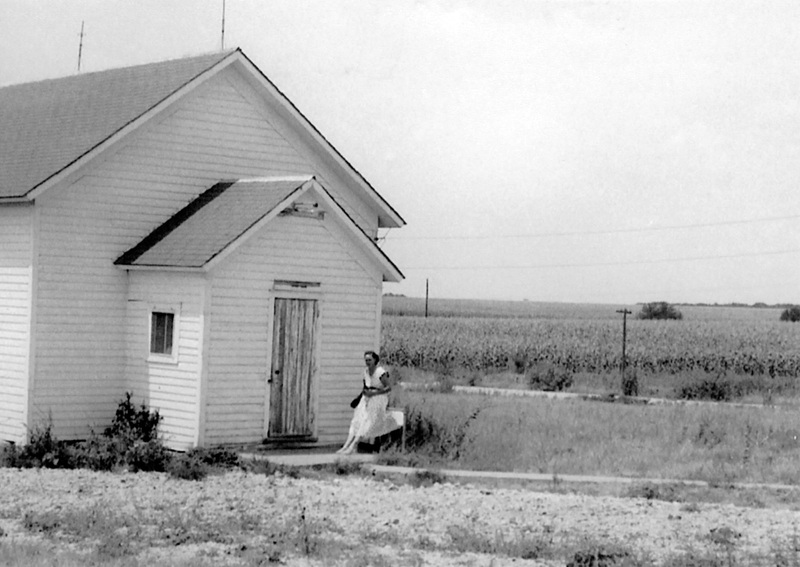 By 1950, nearly half of the county’s schools had closed and sold their buildings and property. Then, in 1963 the first statewide school legislation was enacted. The plan called for county committees to draw district lines and the state set minimum district enrollment numbers. It was pursuant to that legislation that county’s Unified School Districts were created. Subsequently, all of the one-room schools in the county closed. Click on a photo below to view images in a gallery format. School District No. 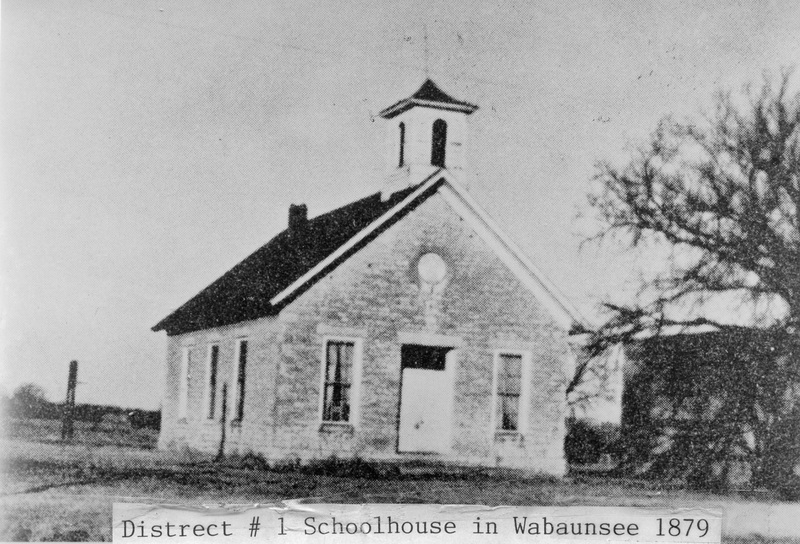 1 at Wabaunsee was formed in October of 1859, the first public district in Wabaunsee County. School District No. 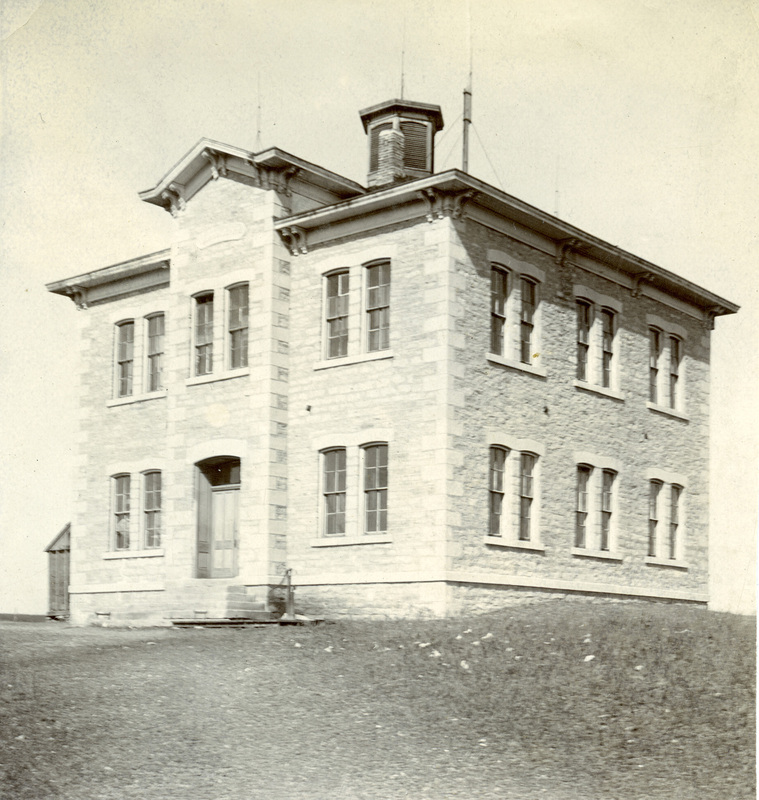 2, also known as the Picolet School, was formed in 1859 and located two miles east of the town of Wabaunsee. Students at School District No. 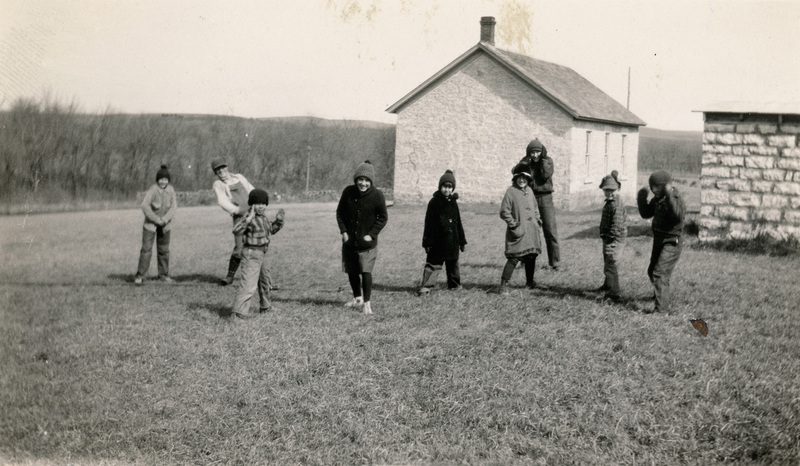 3, formed in 1862 and known as the Bean School, are enjoying recess time in the school yard. Students from District No. 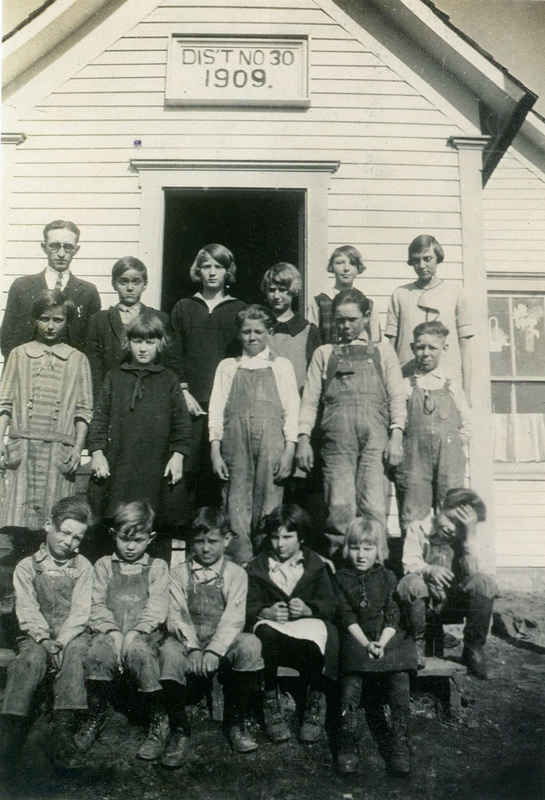 5, the Berryman School, pose with their teacher, Mr. Darrow outside their school, located two miles west of Dover on K-4 Highway. Students enjoy the playground equipment at District No. 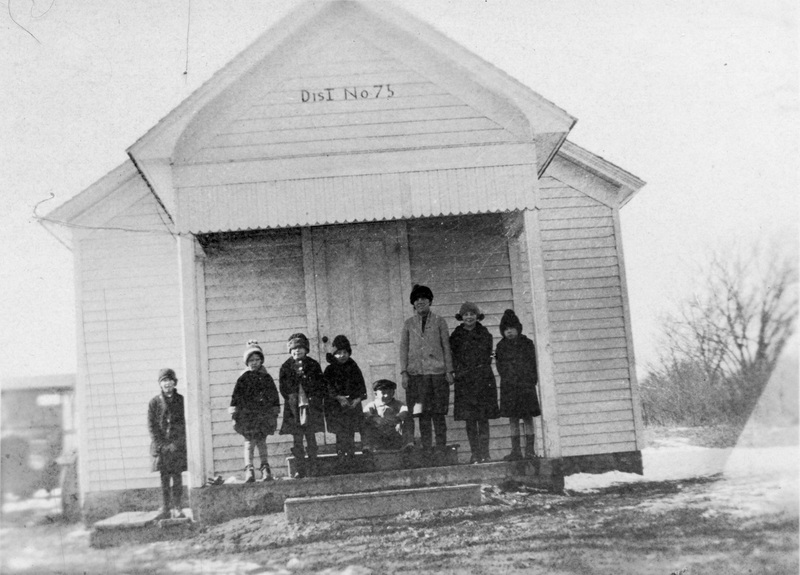 7, the Hopewell School, located in southern Plumb Township. 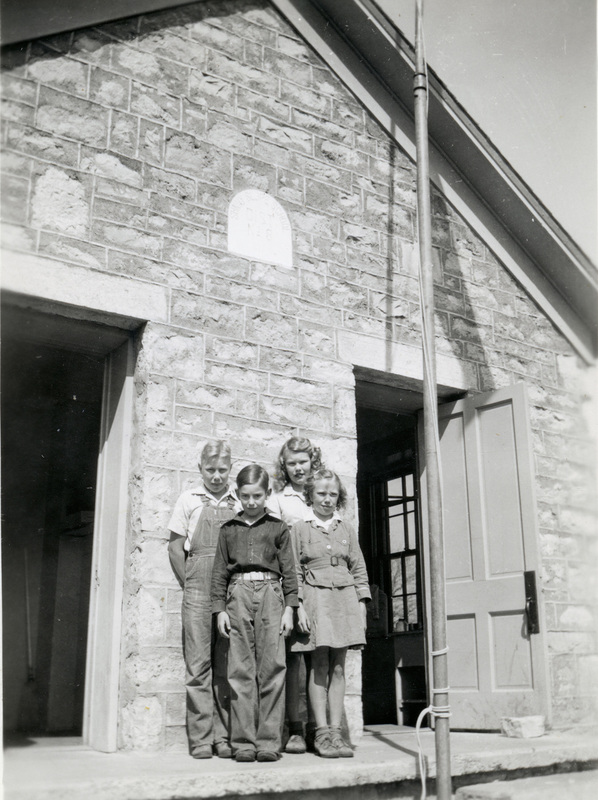 In 1943 the student population of District 9, the Sunny Slope School, dropped to four students. 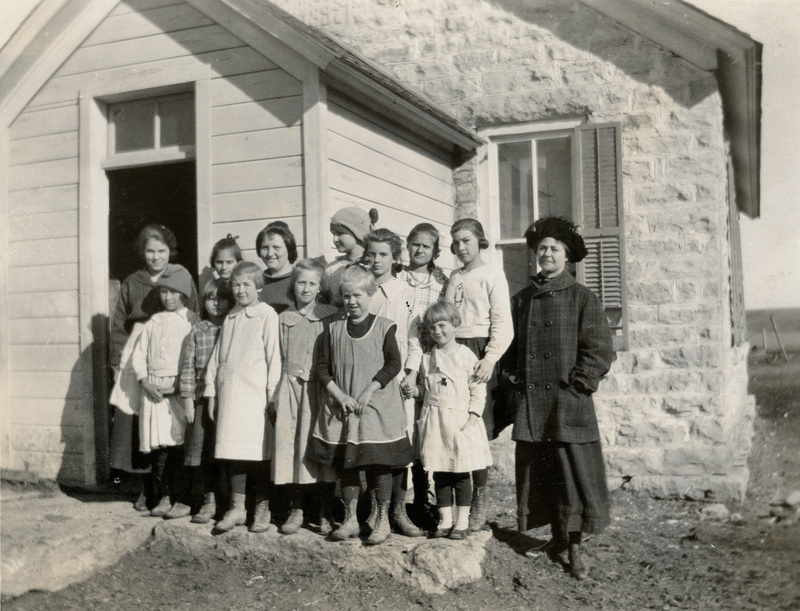 The entire student body is seen on the front porch of the school, including Ray Simon and Nadine Heder on the back row, and Loren Fink and June Simon on the front row. 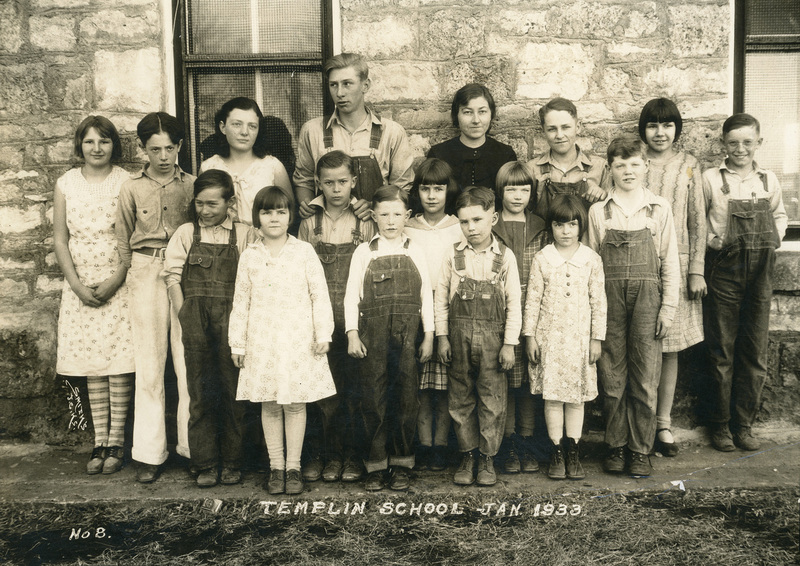 Students from District 10, the Templin School, pose for their school photo in January of 1933. 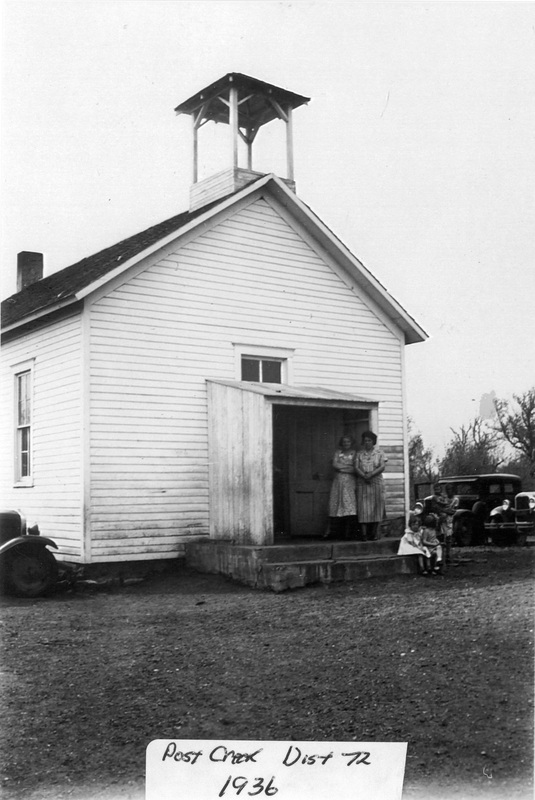 The Templin school is located in northern Garfield Township. 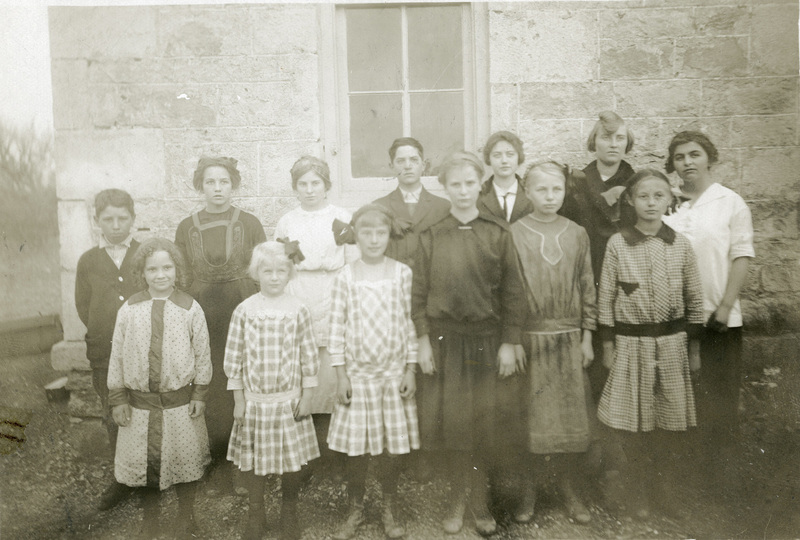 Students from District 11, Wilmington School, pose for their school photo on December 16th, 1910. 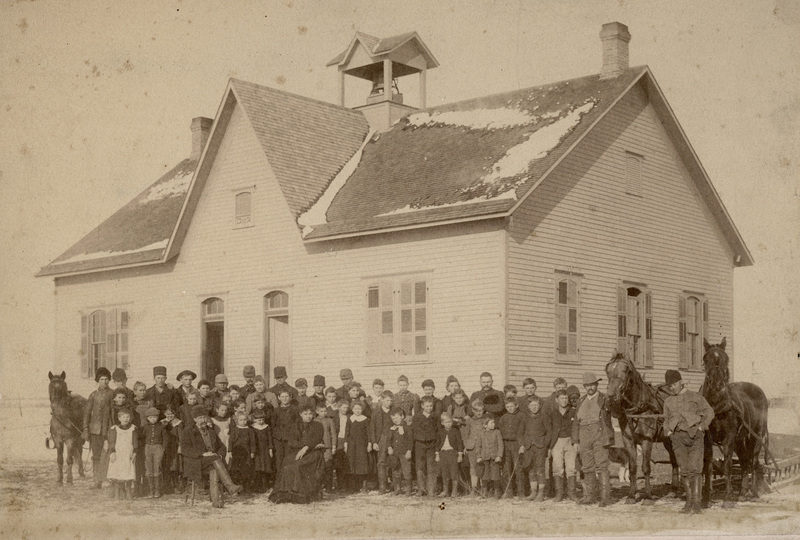 This view of District 12, Harveyville School, was located just west of town, and when this 1886 photo was taken, Mary Woods Hodgson was the teacher. 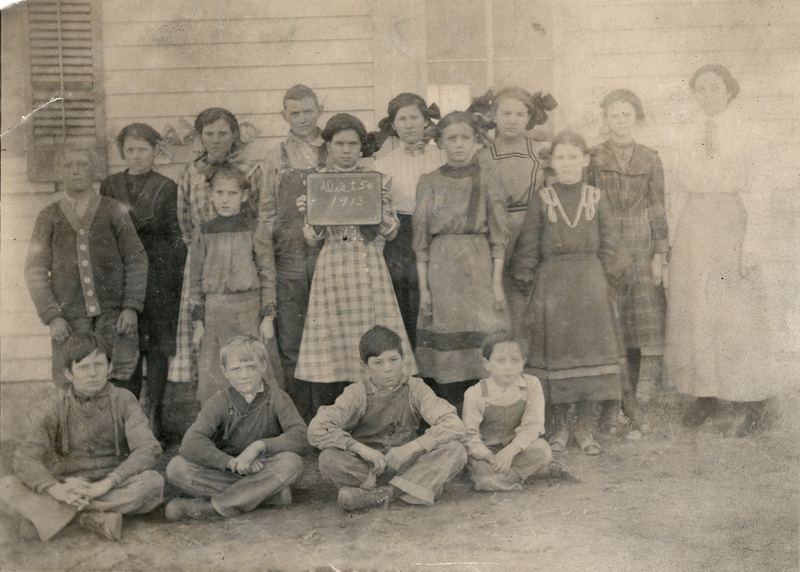 A group of students stand in a wagon parked next to District 14, the Halifax School. 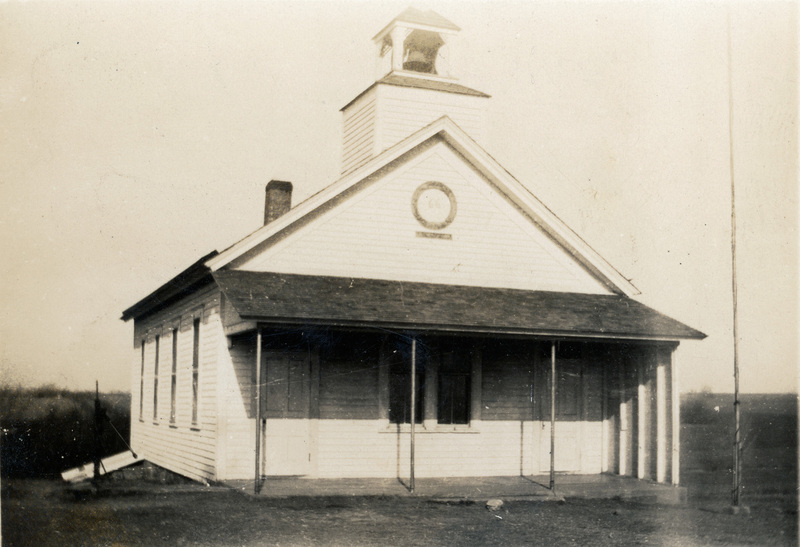 The 1st school was organized at Hinerville in 1869, and it 1898 this school was constructed at the corner of Highway 99 and Hinerville Rd. A group of students at District 15, the Hinerville School, pose on the Merry-go-round for a photographer. 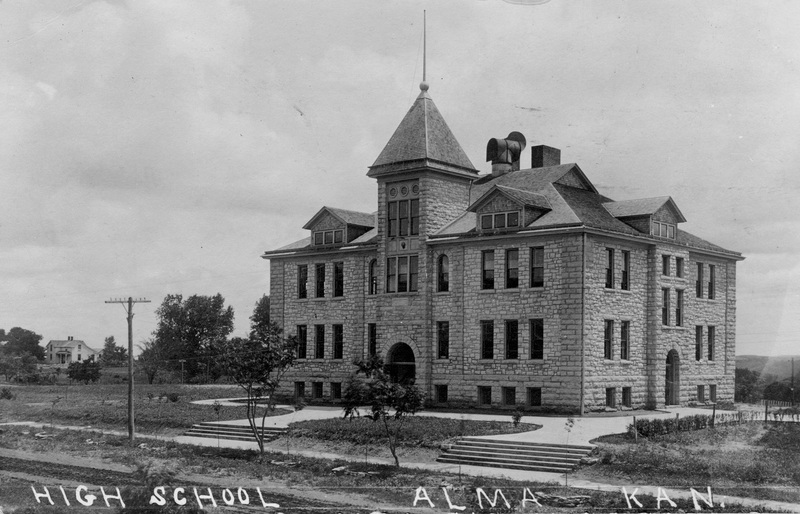 This real photo postcard view of the new Alma High School was taken when the building opened in 1907. This Gus Meier photo of the new Alma High School, a Works Progress Administration project, was created in 1939. 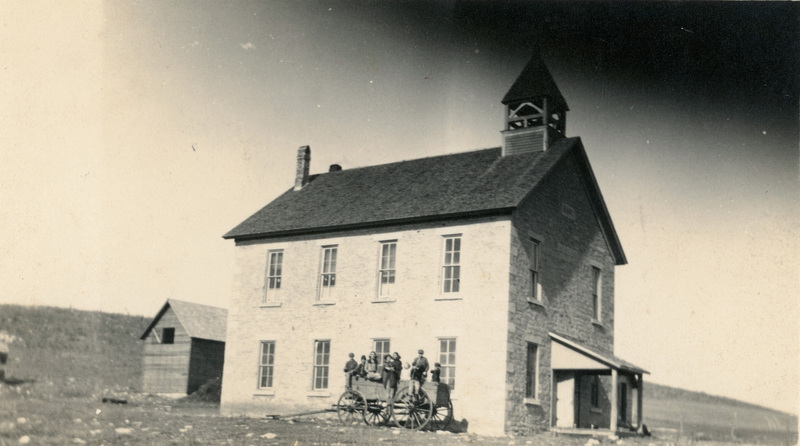 The first Alma High School was constructed in 1875 on the tall hill in the northwest corner of town. The school had no electricity, nor running water. 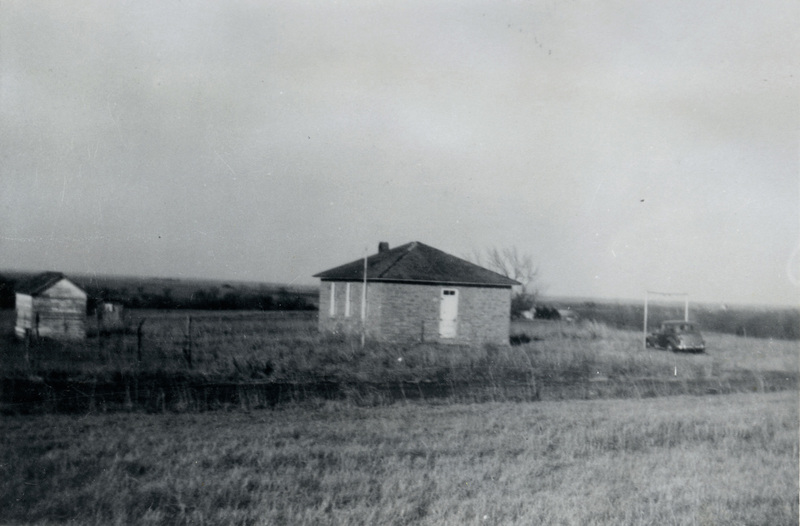 This view of District 18, the Springcreek School, located on West Springcreek Road is dated 1951. 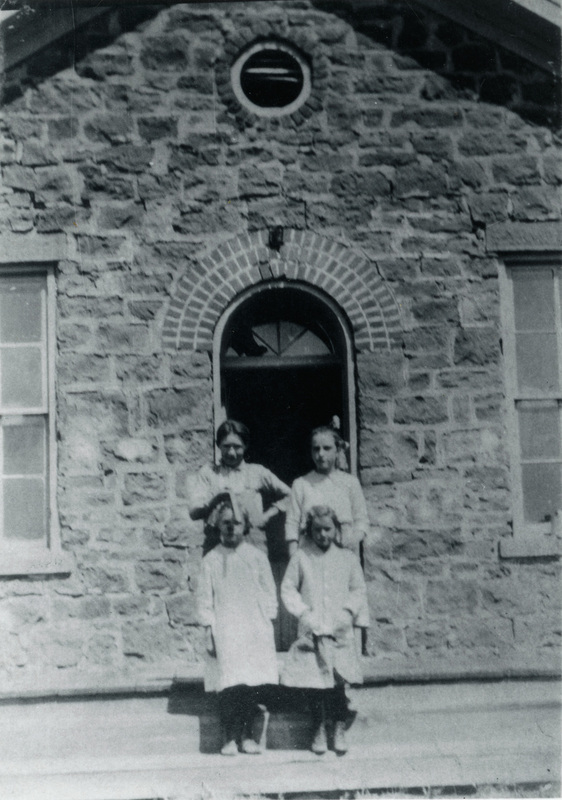 Students from District 20, the Cousins School, gather at the front door of the school for their 1923 school photo. 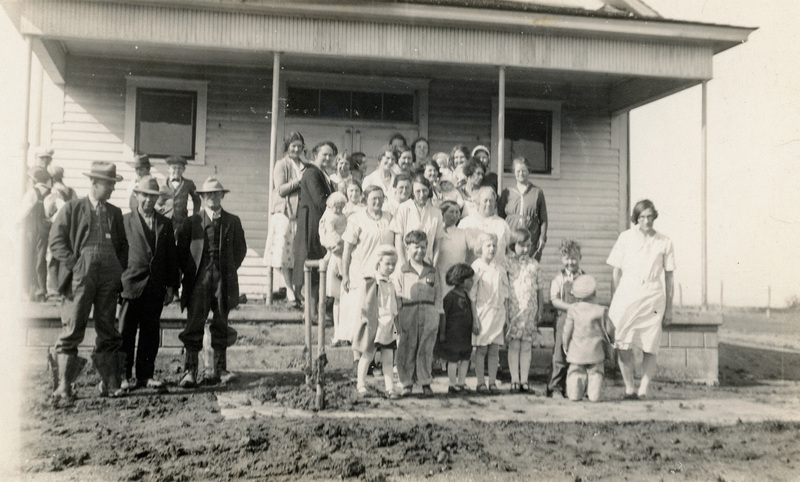 Standing on the back row, left to right, are Ralph Tucker, Charley Jones, Alice Bennett, Hazel Grimm, Neola Wheat, and Mabel Tucker. 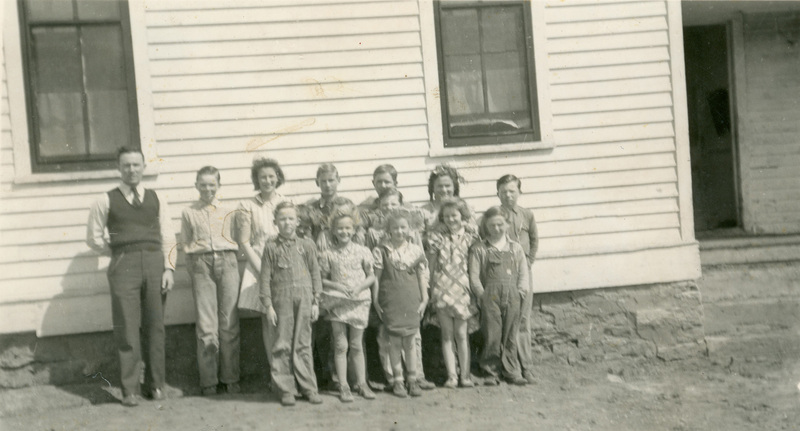 The front row, left to right, includes Virgie Wheat, Phil Bennett, Jim Bennett, Margaret Schwarting, and Pearl Tucker. District No. 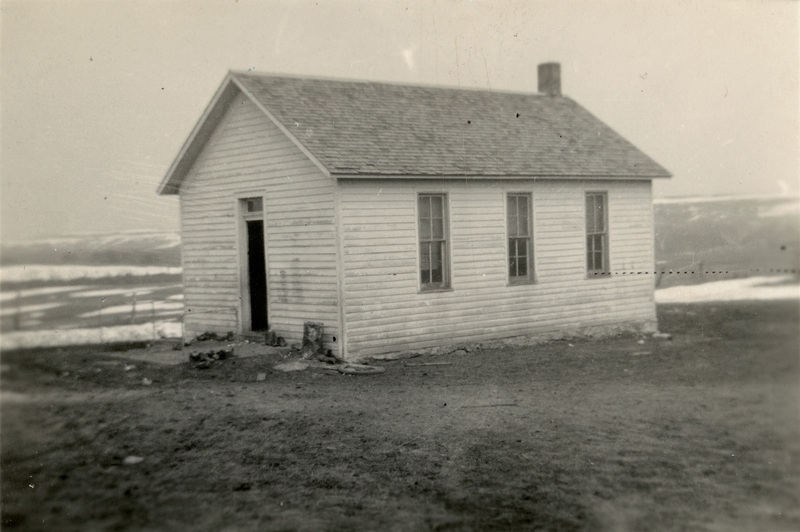 23, the Chalk School is located in Rock Creek Township next to the Chalk Cemetery. District No. 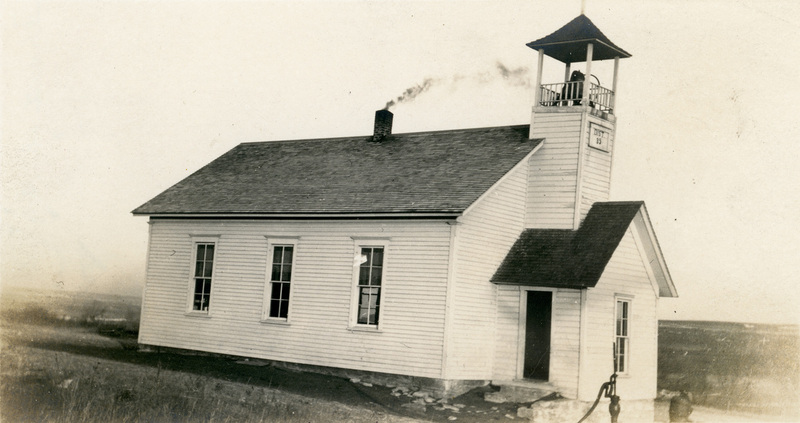 24, the Snokomo School is the one of two school buildings in Wabaunsee County currently listed on the National Register of Historic Places. In this view, circa 1920, the Woodman Hall is visible in the background. 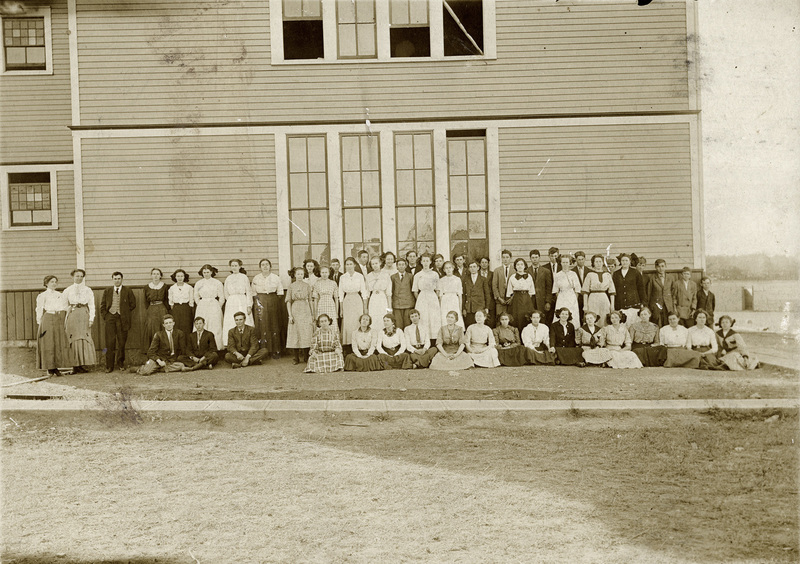 Students from District 25, the Parkdale School, stand in front of the school for their class photograph, circa 1930. A crowd of parents and family gathered at District 26, the Volland School, to celebrate the last day of the school term. 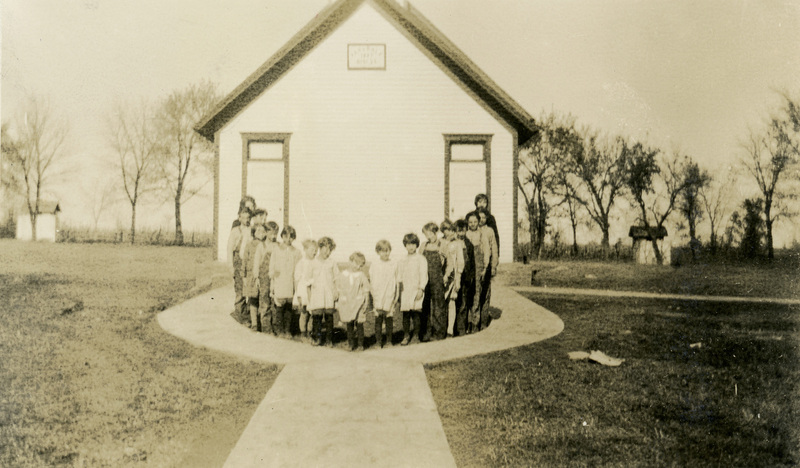 Students from District 27, the Bradford School, pose next to their school building in this view from the spring of 1929. District 28, Rockton School was located in Mission Creek Township, Section 24. 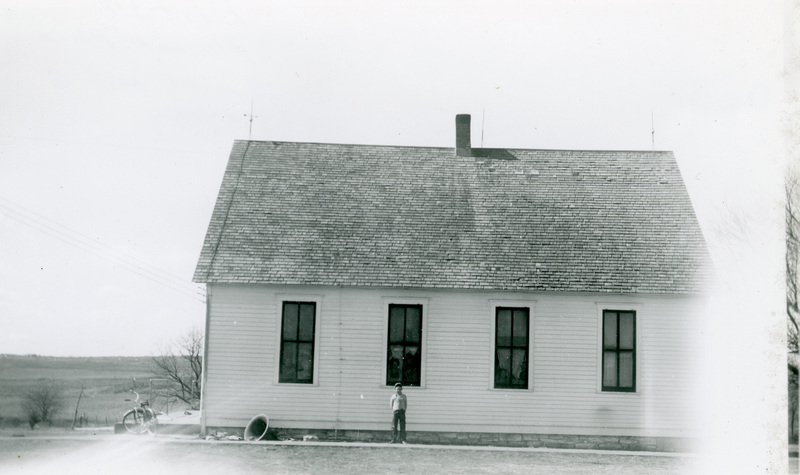 An unidentified man stands next to the District 29 Pleasant Plain School, located three miles east of Eskridge. School District 30, the Pleasant Hill School was located on the far eastern edge of Plumb Township. School District 32, the Lower Snokomo School, also known as the Haubold School was located on the west side of Snokomo Road, south of Interstate 70. 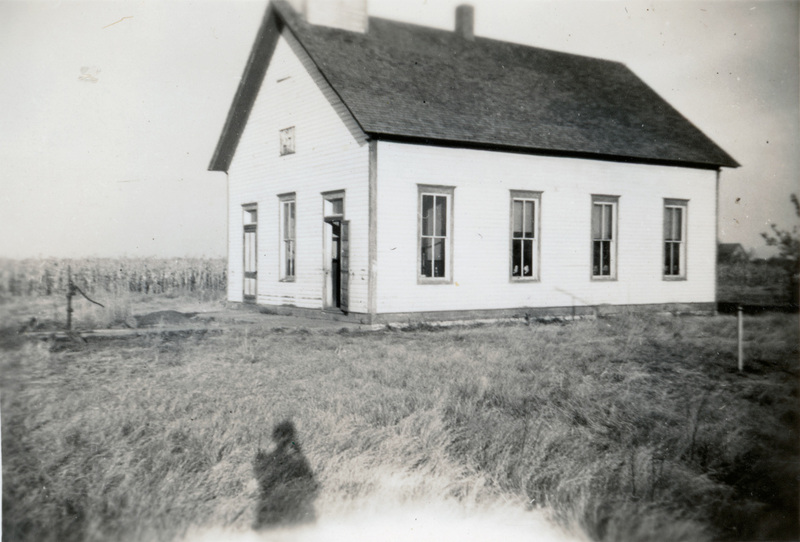 In this view, dated 1936, teacher Frances Allen stands beside the schoolhouse. 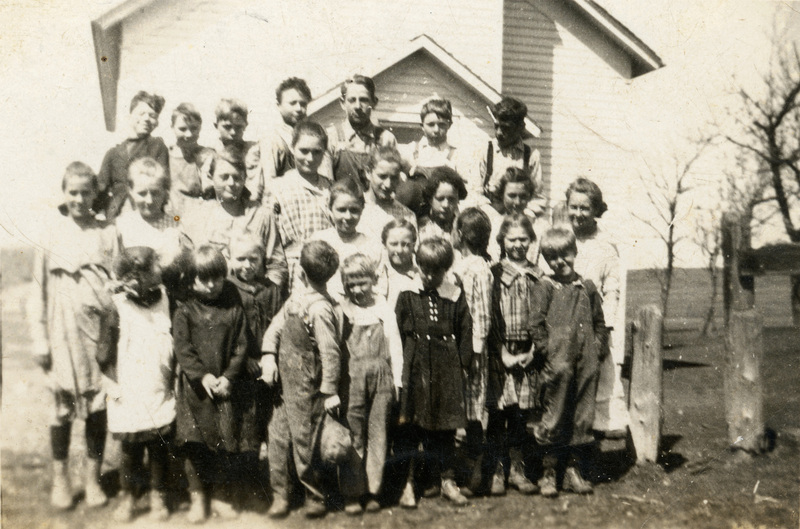 District 32 students pose for their 1936 school photo beside the Lower Snokomo School. 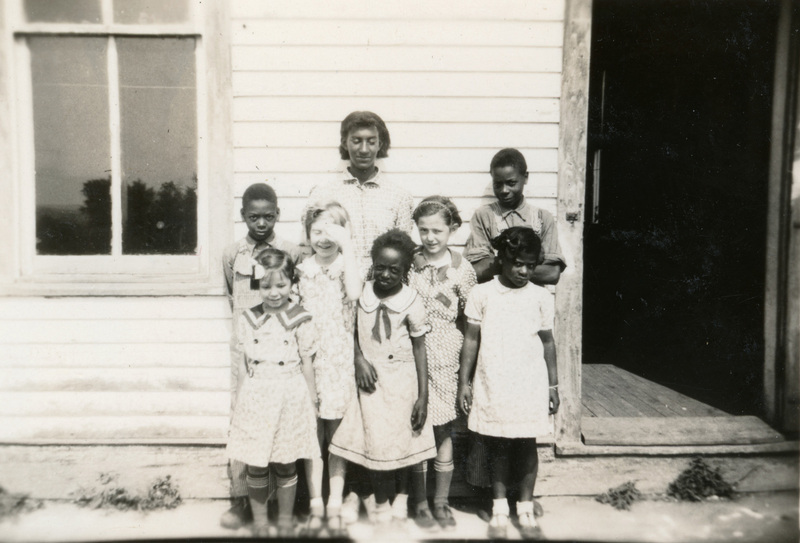 The students included Kenneth and Corlye Bloomfield, Winston Barthuly, Wilma Lee Gnadt, Nola Jean Anderson, Shirley Schutter, Mildred, Juanita, Dale, and Nyla Lietz. 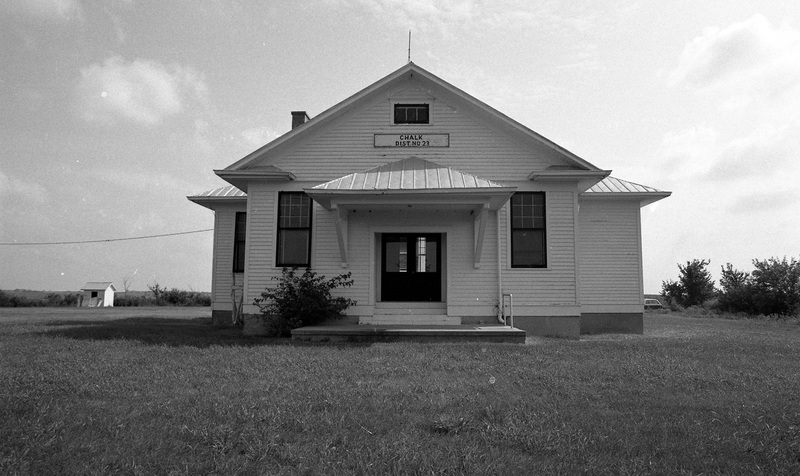 District 33, the Greenwood School was located on the north edge of Kaw Township. The number of parents and relatives attending the last day of school in this view of District 34, Wells Creek School, exceeded the number of students attending the school. 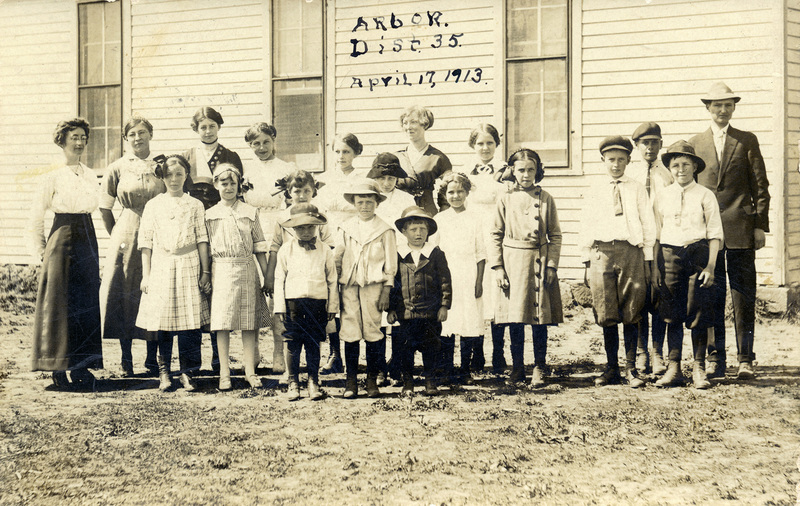 Students at District 35, the Arbor School, also known as Union Center, celebrated the last day of school on April 17, 1913 as seen on this real photo postcard. The Union Center School, District 35, was located on Skyline Road in Mill Creek Township. The school burned in 1990. 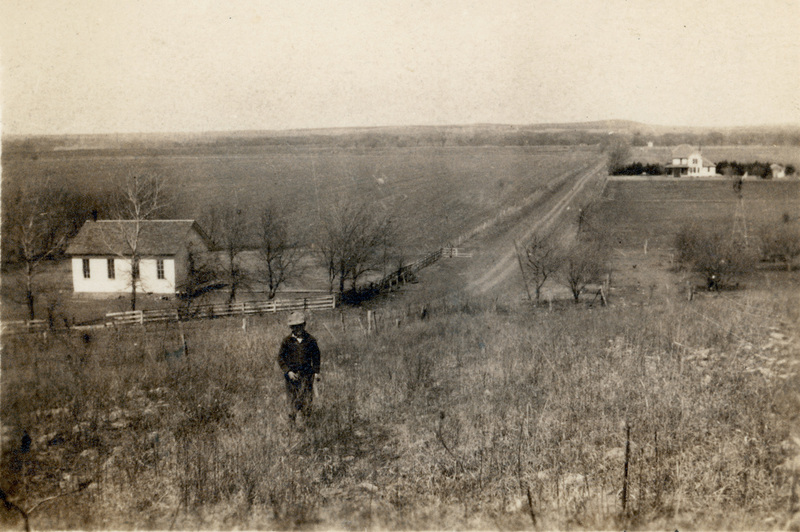 This view of Vera and the Vera School District 37, seen at the left, looks to the north on Vera Road from what is now Interstate 70. 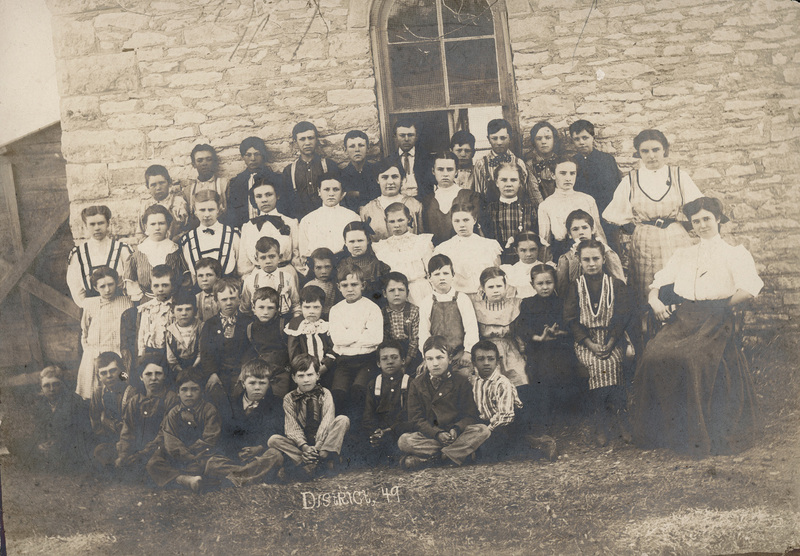 Katie Sisson taught at District 38, Pleasant Valley School when this photo of the class and Miss Sisson was taken. 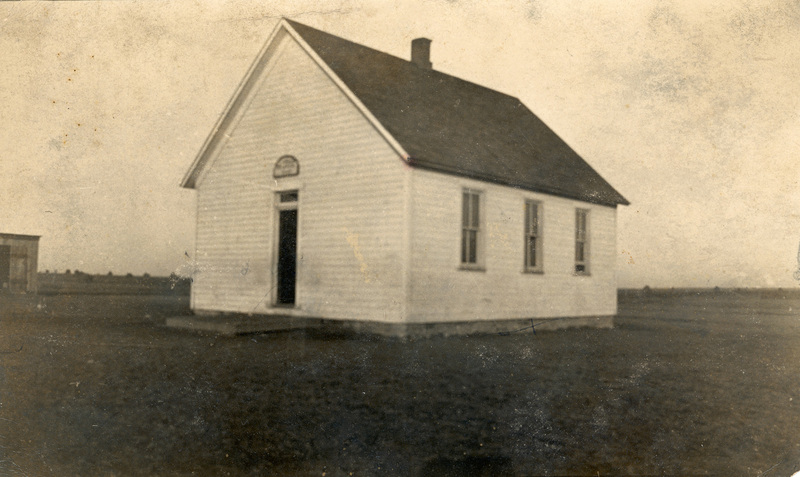 Pleasant Valley School was located just three miles northwest of Harveyville, Kansas. 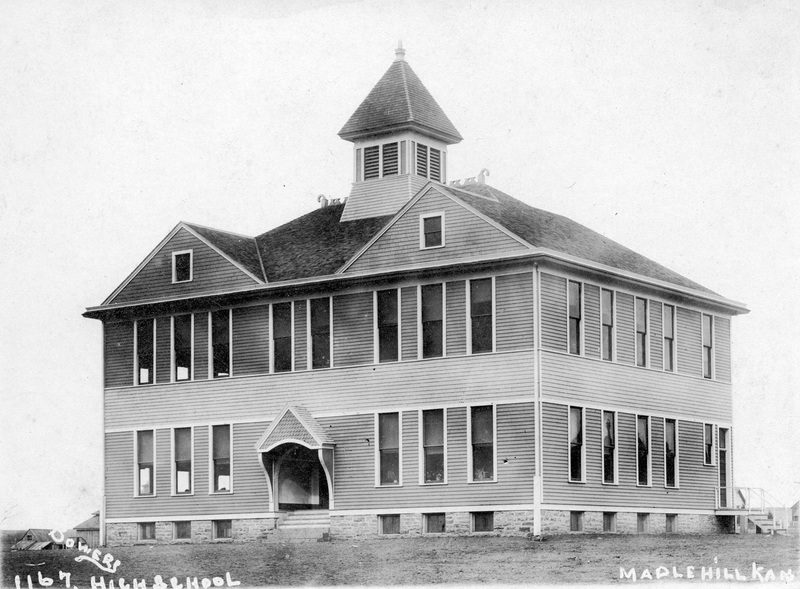 This real photo postcard shows the District 39, Maple Hill High School which opened in 1905. 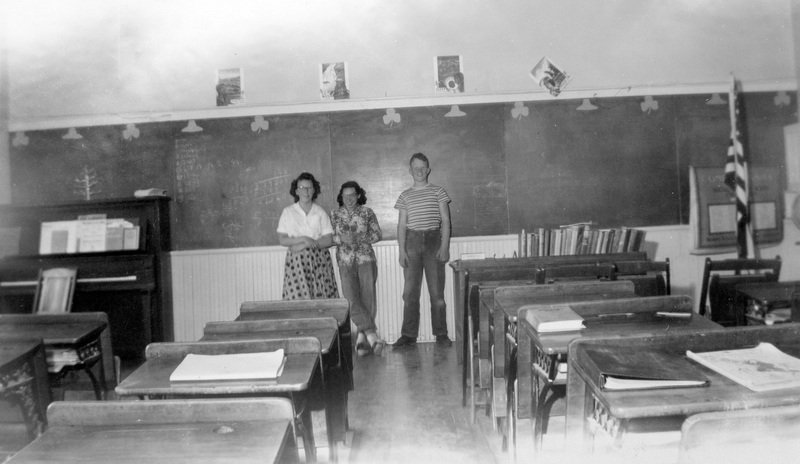 Students at the Star School stand at the blackboard in the interior view of the District 40 School. 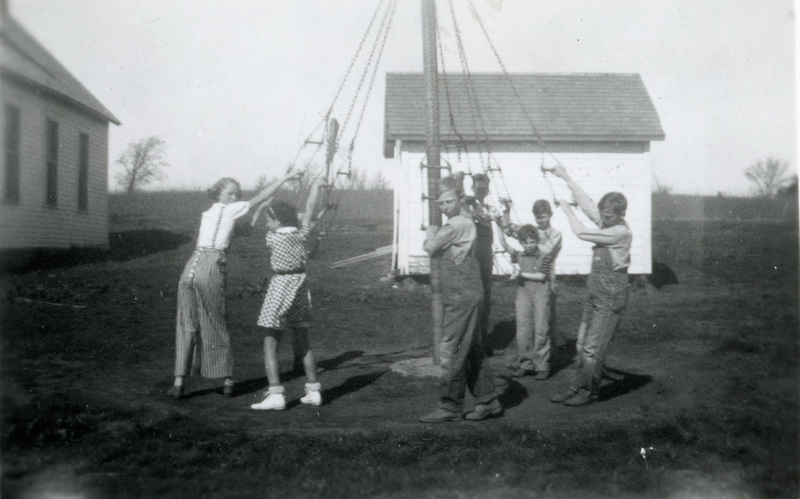 Standing, left to right are, Sheila Joe Belt Nelson, Alice Romig Parsons, and Eugene Stephenson. 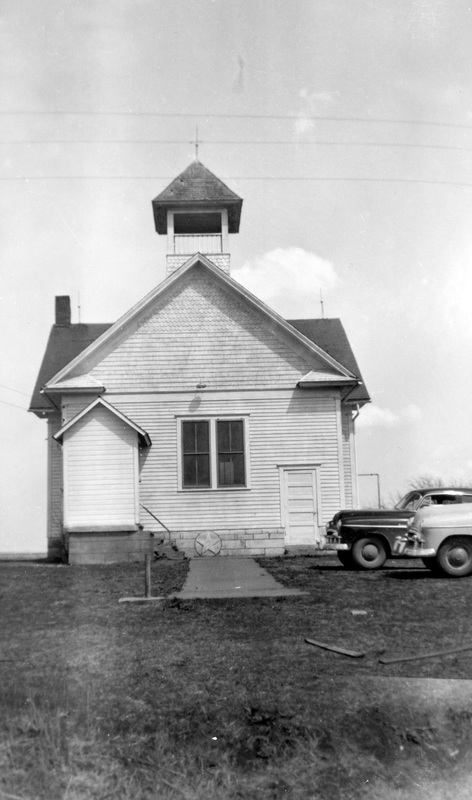 The Star School was located four miles south of Eskridge in Wilmington Township. Notice the star cut into the school’s foundation. This early cabinet card by photographer W.F. 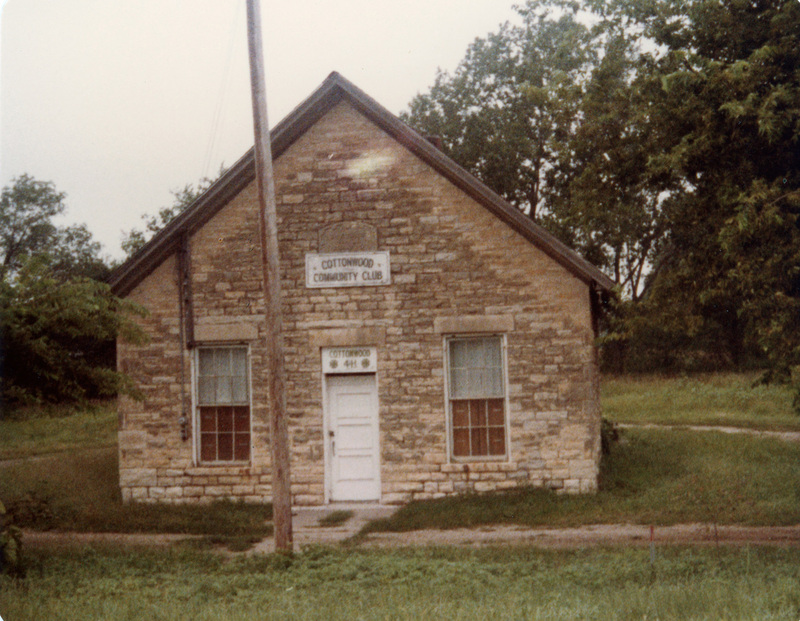 Farrow of Topeka shows the School District 41 school at McFarland. Dry Creek School District 43 was located in Maple Hill Township, four miles south of Maple Hill. 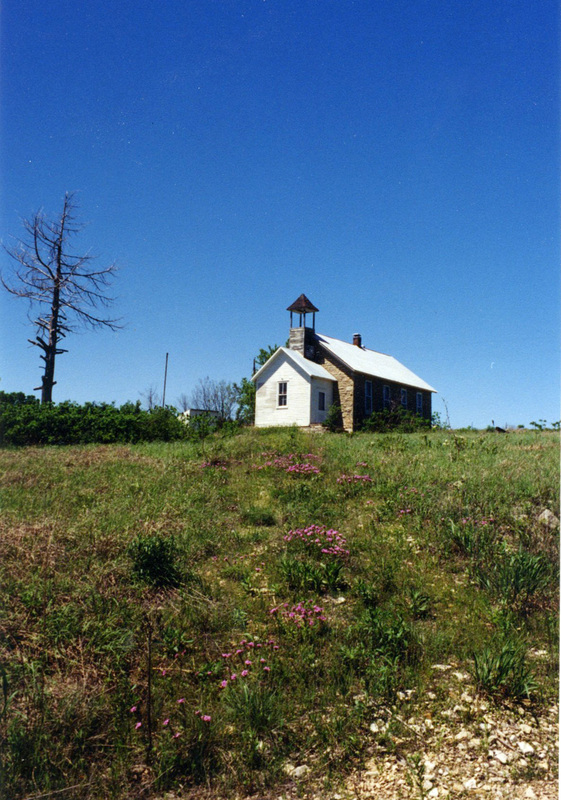 The Rehrig School, District 44 was located on the south edge of Wilmington Township, seven miles south of Eskridge. 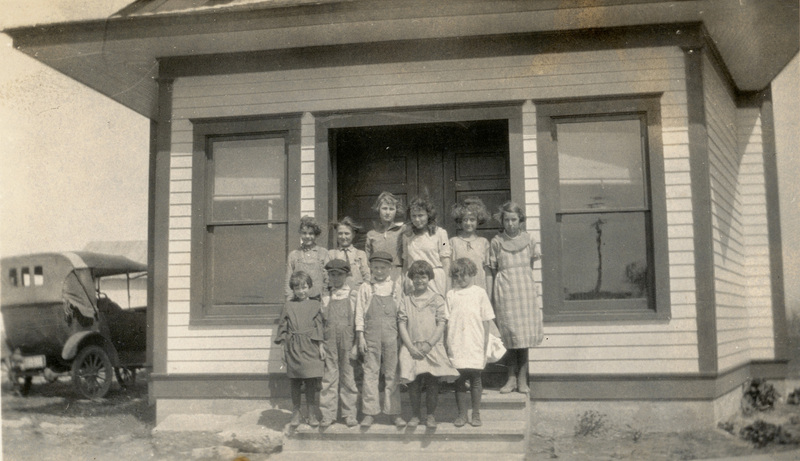 Students and a teacher from District 45 Sunbeam School pose in front of their school, located nine miles south of Alma at the junction of K-4 and K-99 Highways. Four students stand in front of School District 46 Rocky Ford School, located on the far east edge of Maple Hill Township. 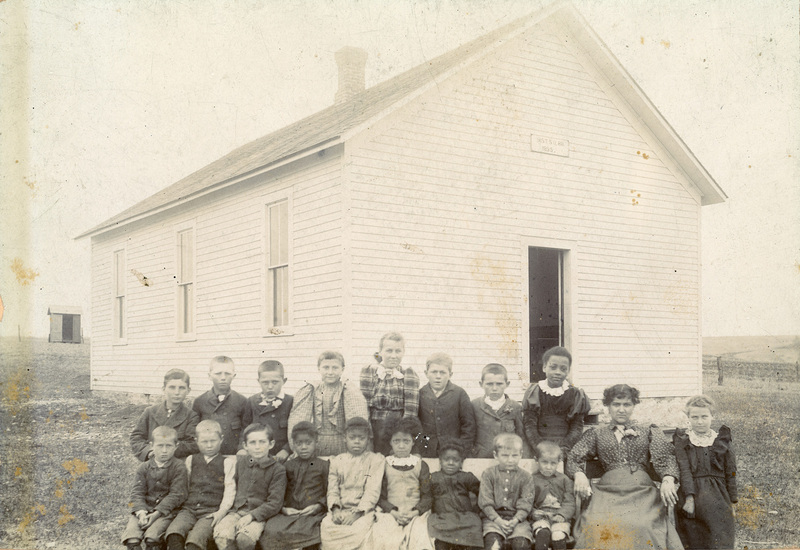 Students from District 49 Mission View School pose for their school photo at the side of the schoolhouse. District 49 was located in the northwest corner of Mission Creek Township. 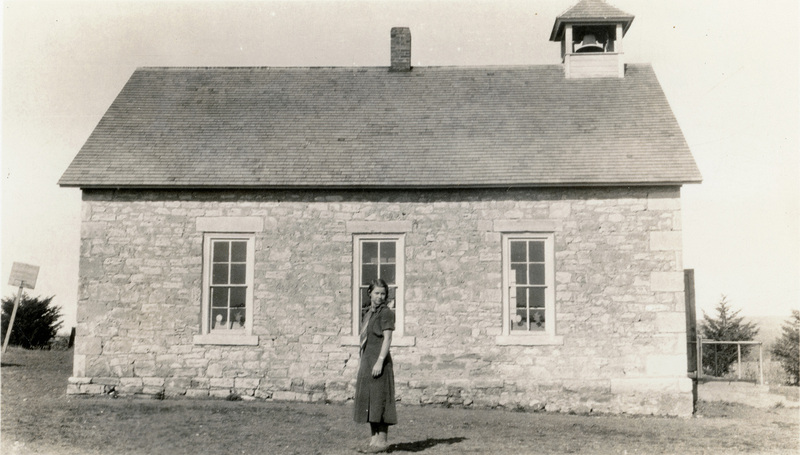 District 50 school teacher, Mary Tanyer stands in front of the Mission View school, located in the southwestern edge of Mission Creek Township. 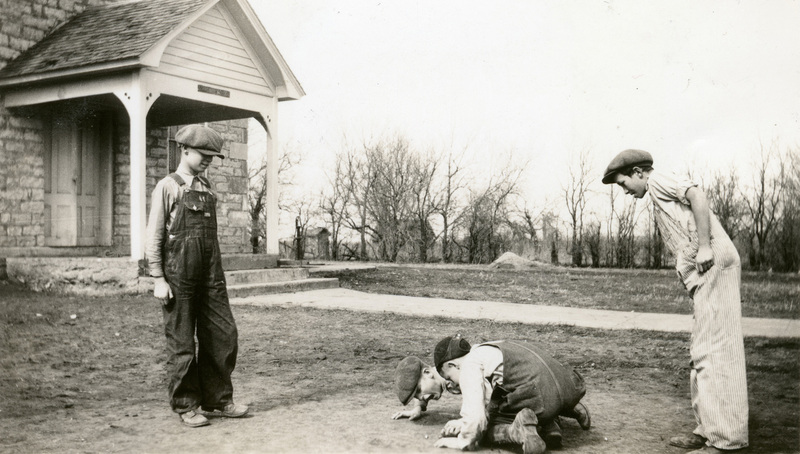 Students at District 51, the Poor Farm School, play during recess. District 51 was located in northern Farmer Township. 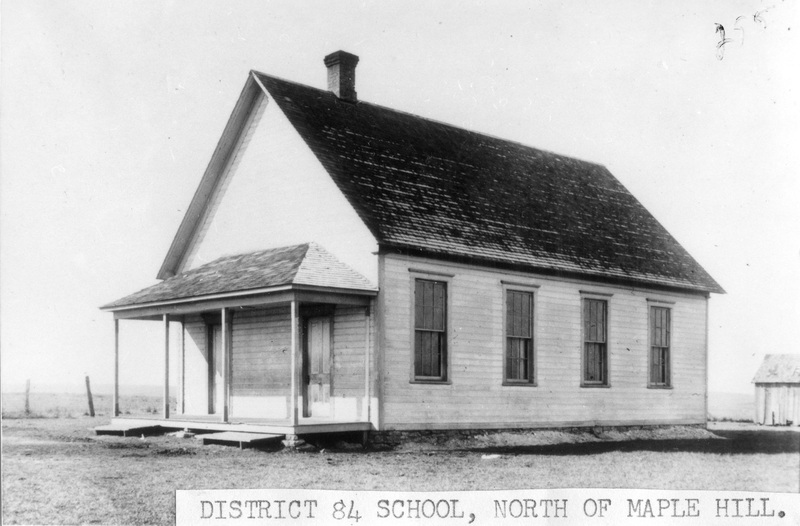 District 53, the Des Moines School, seen in this 1882 photograph, was located in the far southwestern edge of Rock Creek Township. 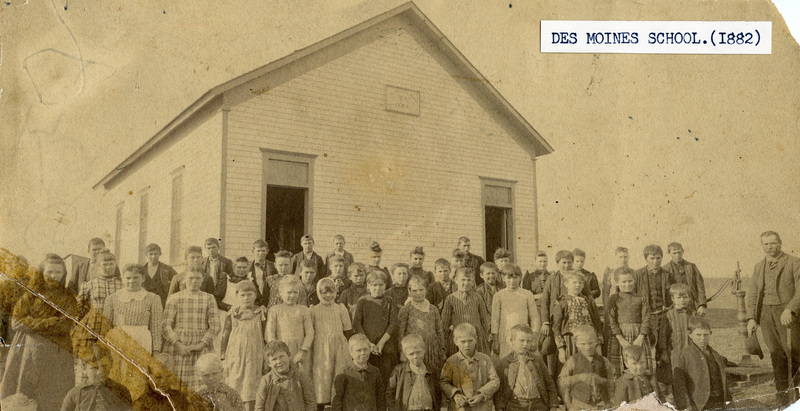 Students from District 54, the Mainey School pose by their schoolhouse for their 1913 school photo. District 54 was located at the far north border of Kaw Township. 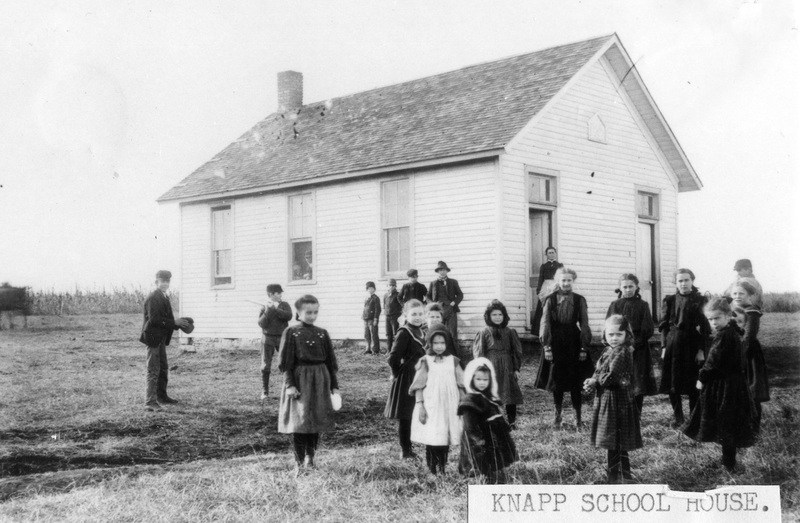 The Knapp School, District 55 was located in the southeast corner of Maple Hill Township. 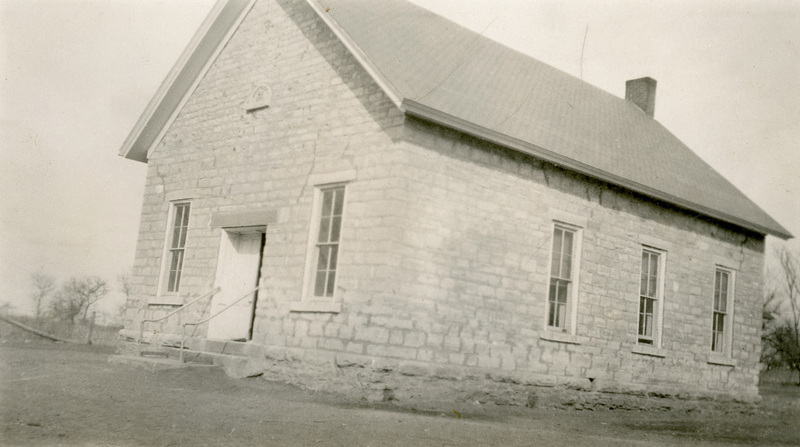 This school burned in 1930, and when the new building was constructed, it was called the Sunnyside School. The Keene School, District 56, located in the town of Keene, was built in 1886 and closed in the late 1960s with statewide consolidation. 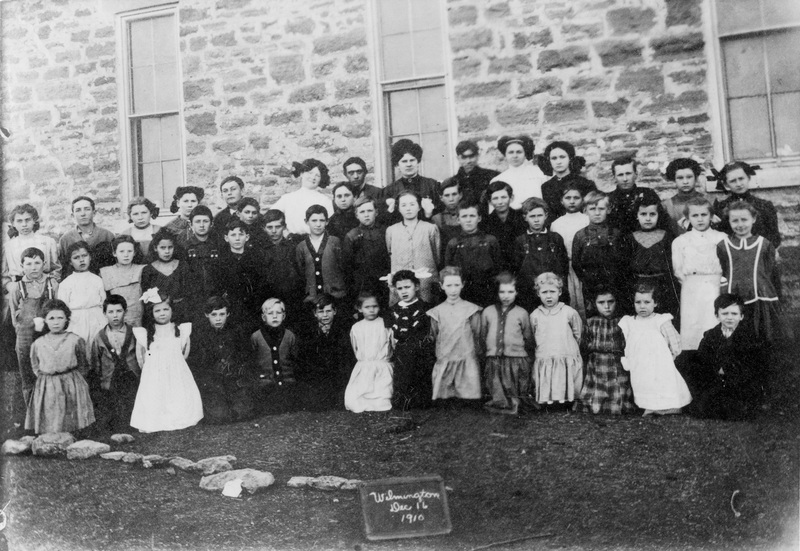 In this view, circa 1890, a large group of students are photographed in front of the two-room school. The Curtis School, District 58 was located in the northeast corner of Newbury Township. 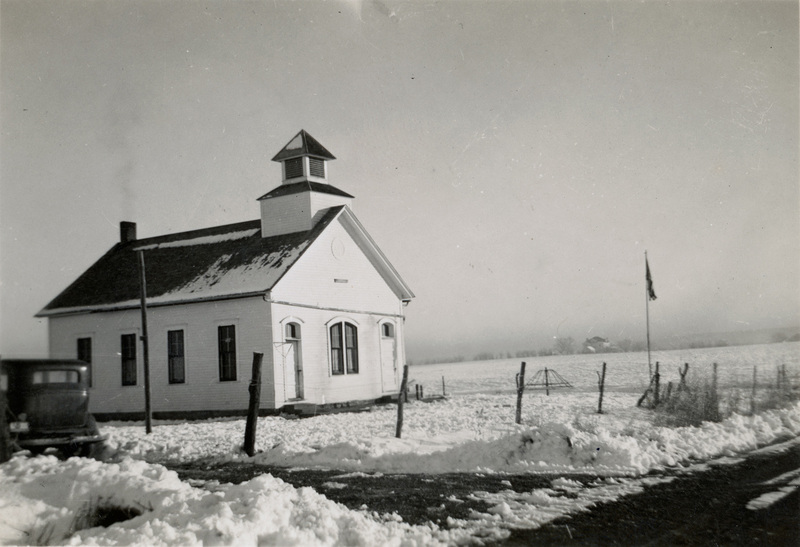 This view of the school is dated 1946. 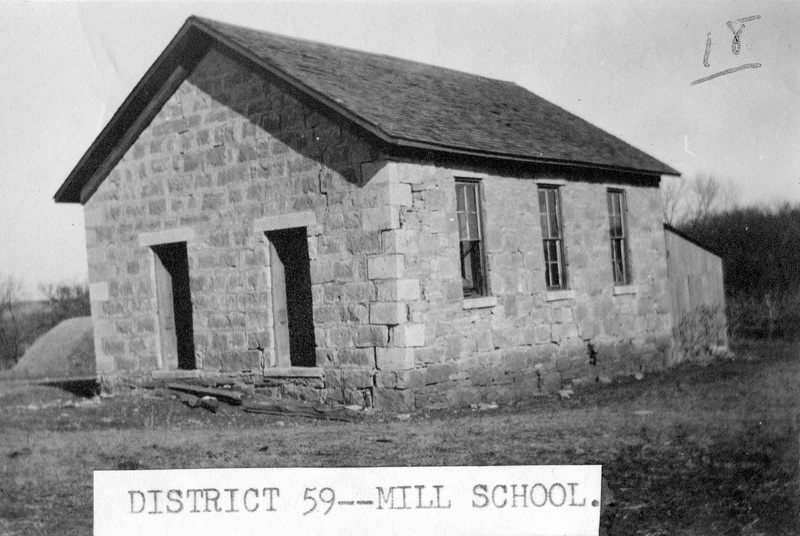 District 59, the Mill School was located just east of Paxico near “old Paxico”. 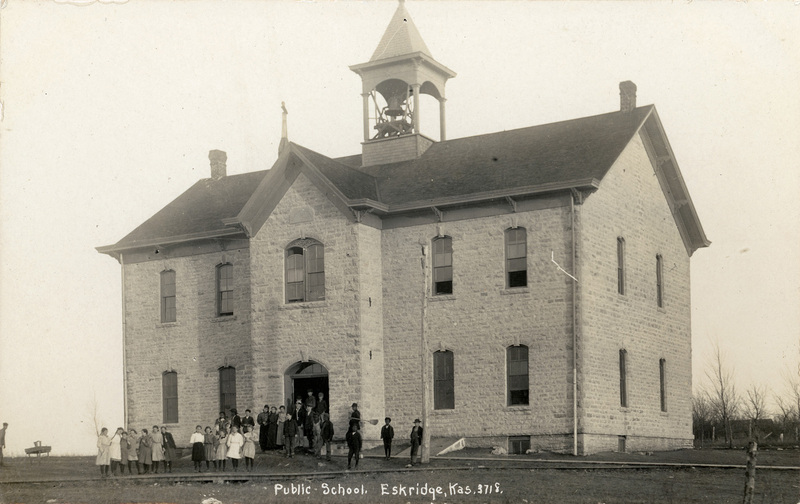 Eskridge Public School, District 63 built this school in 1883 on East 2nd Avenue. 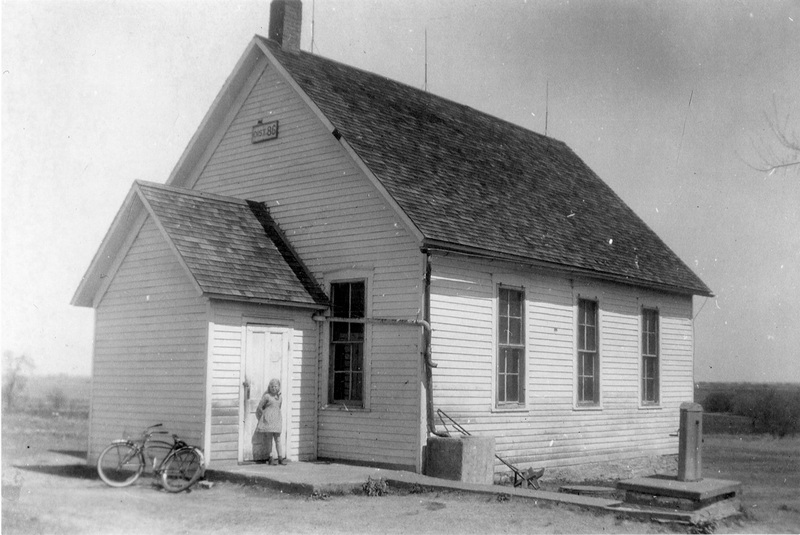 This building was demolished when the new Public School was constructed in 1910. 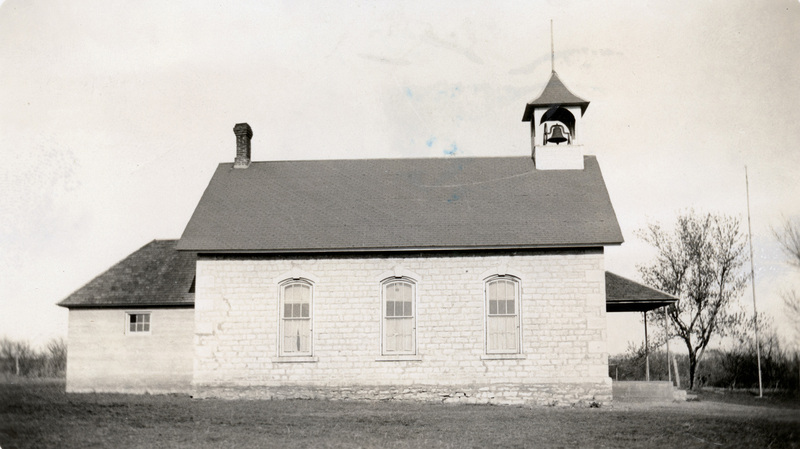 District 64, the Jones School, was located four miles south of the town of Wabaunsee. 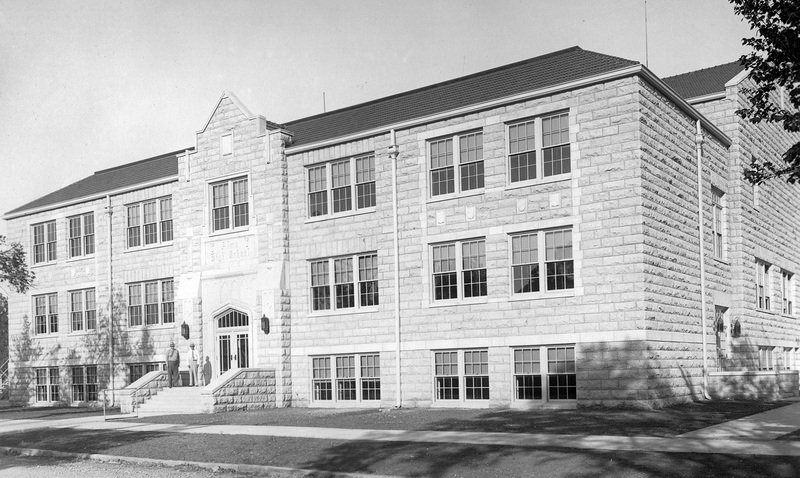 This view is dated 1931-32 school year. 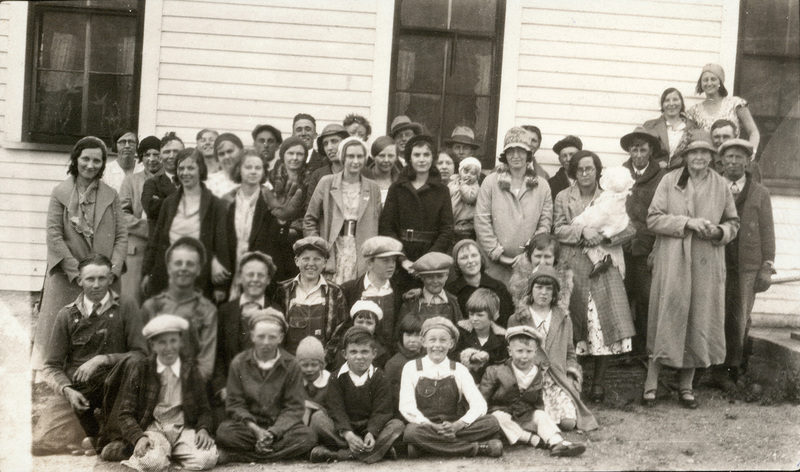 When this last-day-of-school dinner was held at the end of the 1931-1932 school year at the District 65 Dog Creek School, there were only four pupils attending the school. The Kaul School, District 66 was located near the far north edge of Newbury Township. 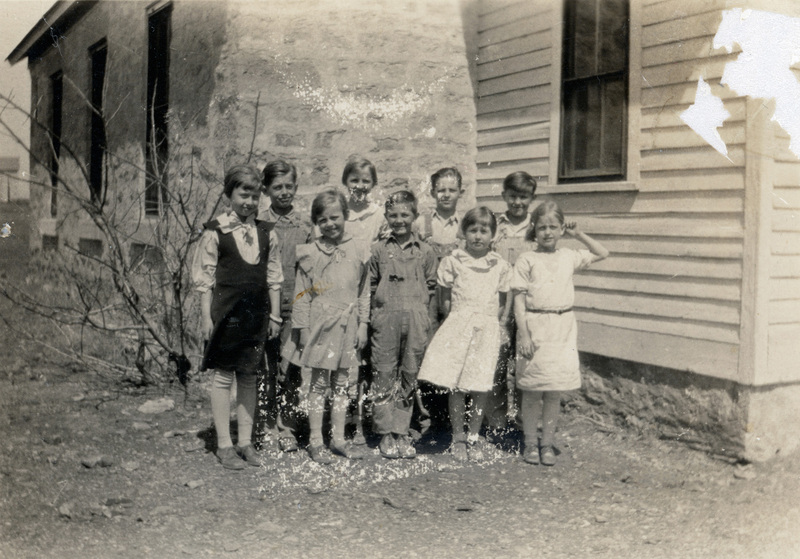 There were nine students at the District 70, Hillside School in 1934. 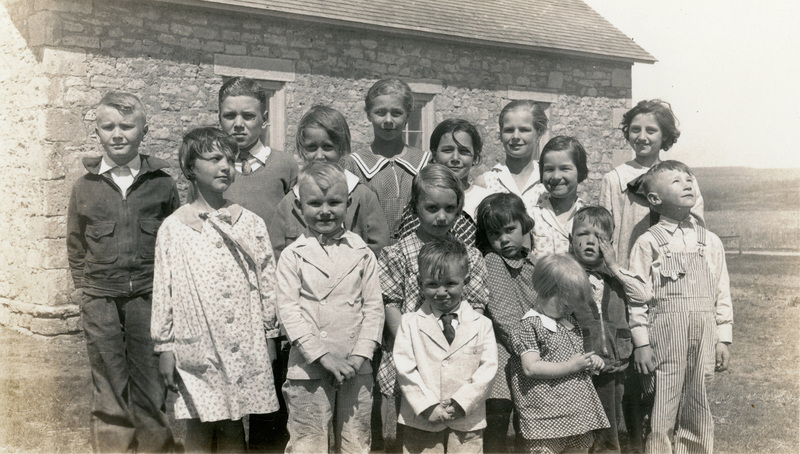 Identified on the front row, left to right, are Maureen Falk, Wanda Falk, Kenneth Zerbe, Vada Brabb, and Elda Mae Fink. 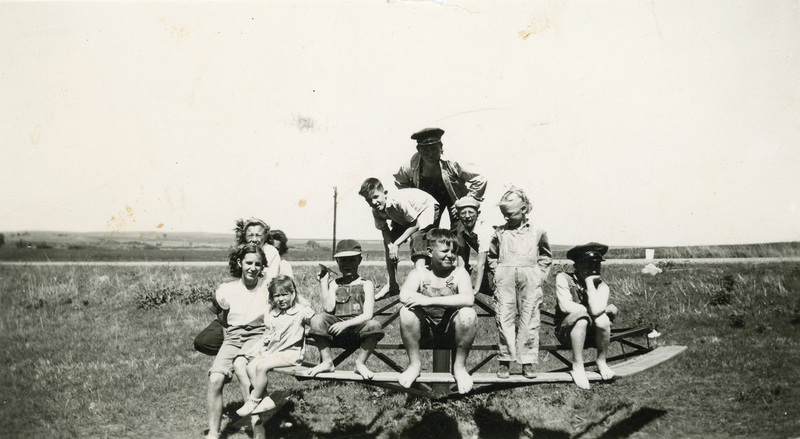 Identified on the back row, left to right, are Kenneth Fink, Mary Brabb, Fred Zerbe and Kenneth Brabb. 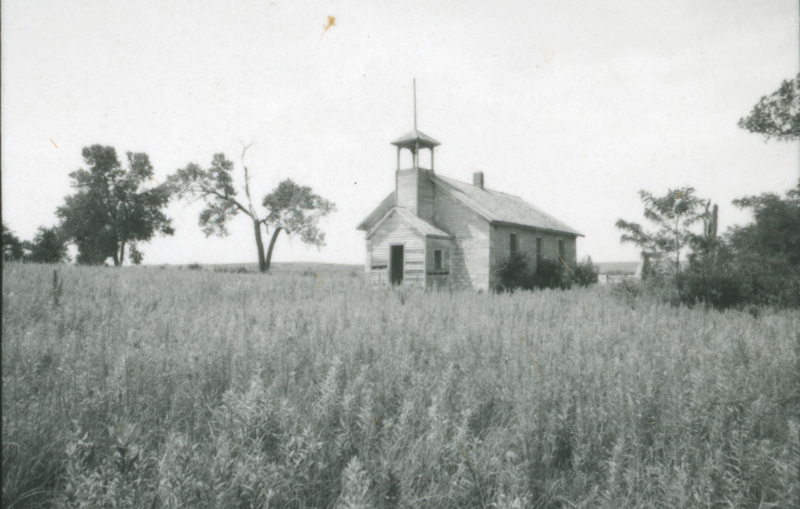 The Cottonwood Grove School, District 71, is located near the far north edge of Wabaunsee Township. District 72, the Post Creek School was located near the northeast edge of Maple Hill Township. 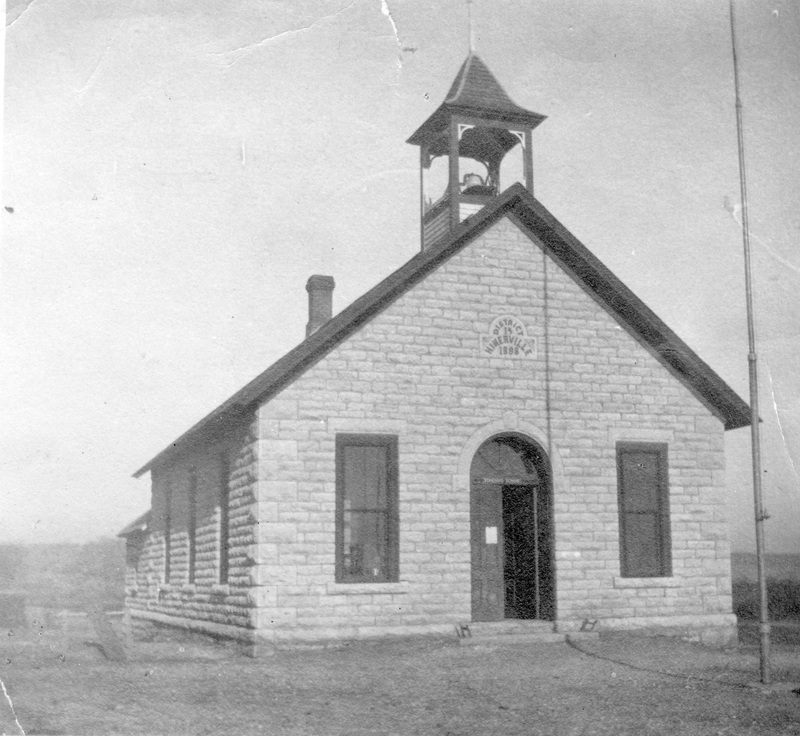 The District 75 School was located in east-central Wabaunsee Township. 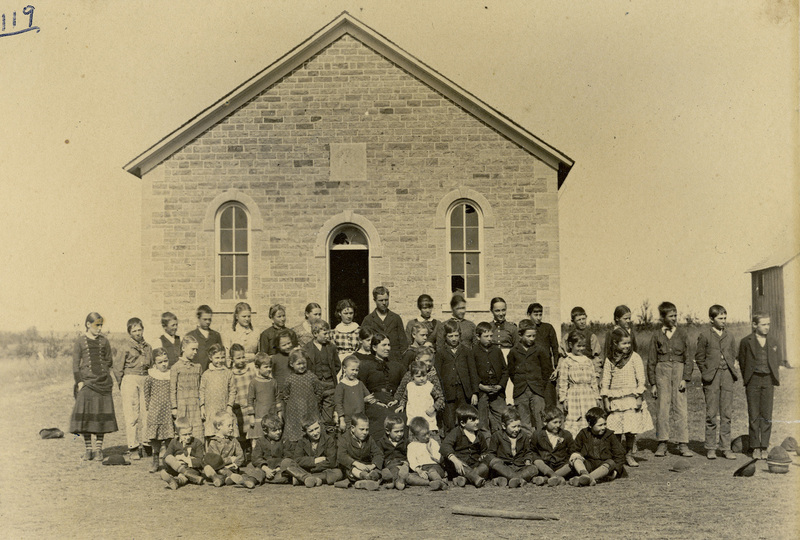 Students from the Haller School, District 76, stand beside the schoolhouse located two miles south of Alma. District 77, the Pleasant View School, was located in the southwest corner of Newbury Township. Students from Mt. 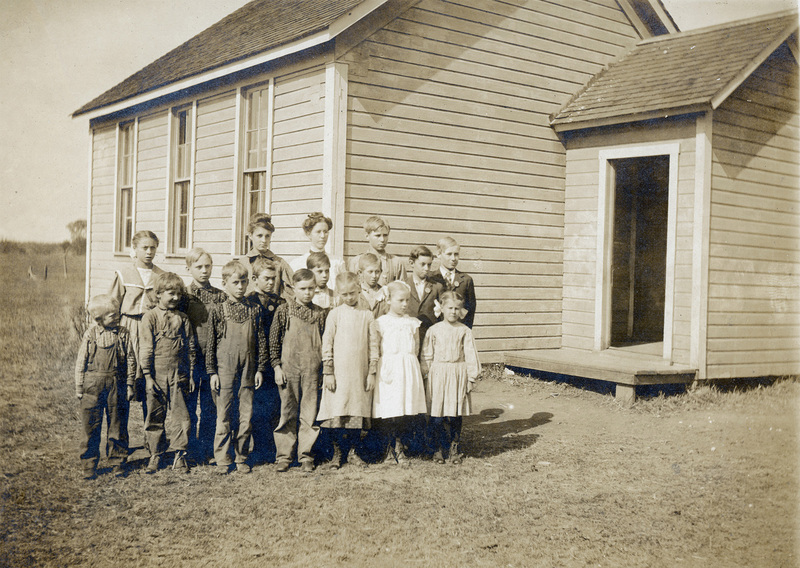 Pleasant School, District 78, pose for their 1919-1920 school photo in front of the schoolhouse. Mt. Pleasant was located in the southeast corner of Rock Creek Township. 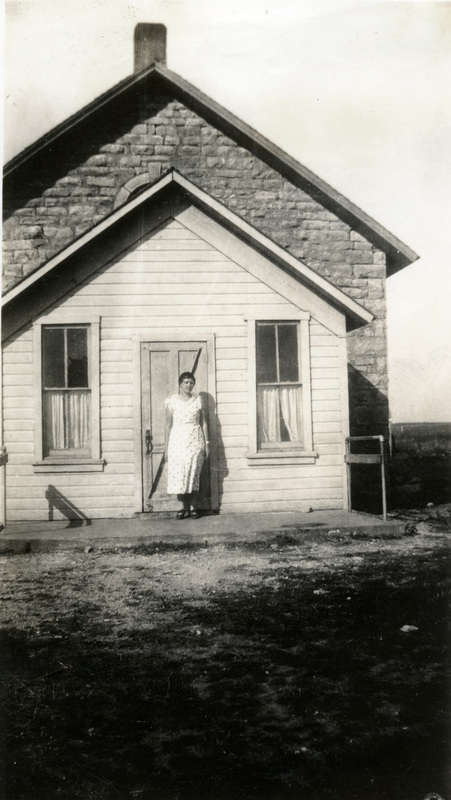 Marie Osborne Yokum stands in front of the District 79 Garfield Center School, located just east of Alta Vista. 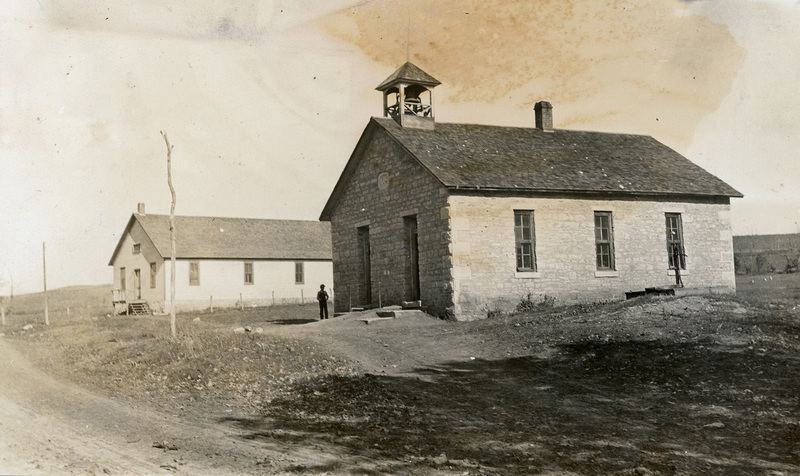 This view of District 81, the Alta Vista City School, was taken in 1912. 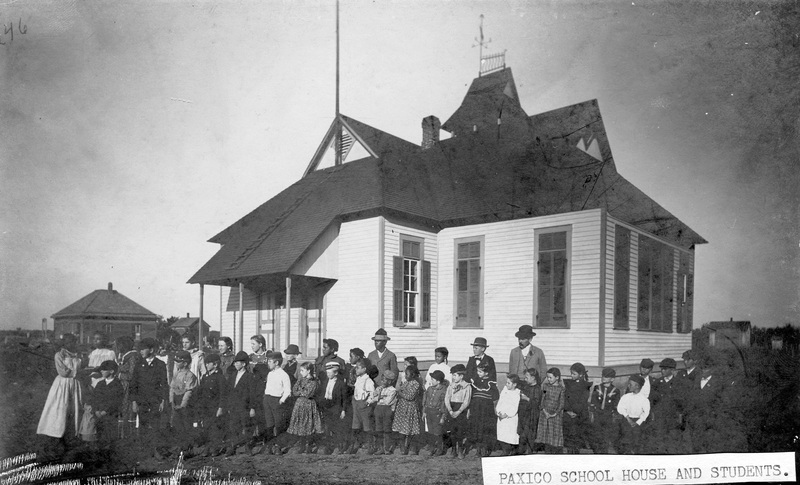 This view of District 82, the Paxico City School, was taken in the early 1900s. District 83, the Mogge School, is located in northwest Mill Creek Township. District 84, the Adams School was located in the northern edge of Maple Hill Township. 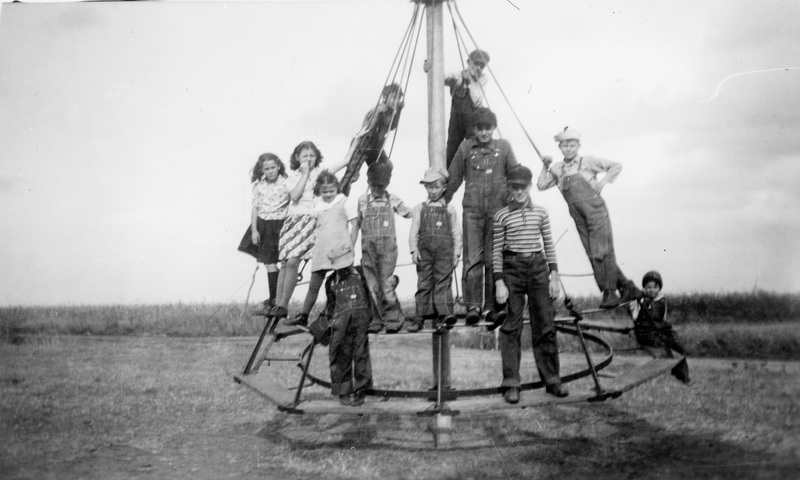 Students from District 85, the Lafayette School, play on a Merry-go-round on the playgrounds at the school, located on the north edge of Plumb Township. District 86, the Mission Point School is located in southwest Plumb Township. Students from District 88, the Fairview School, located in the southeast corner of Mill Creek Township, pose for their school photo with their teacher, Alma Day. Click on the link above to take a virtual tour of the Volland School which was recently restored by Rich and Deb Lind. You can pan the screen by swiping left or right and zoom in by double clicking on the spot you wish to give a closer look. You can also use the + and – keys to zoom in and out. 360-degree photo shot and stitched by Tom Parish.